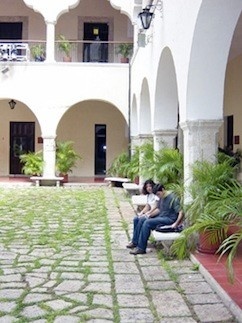 Study at the Universidad Autónoma de Campeche. In the spring of 1998, the cities of Halifax and Campeche twinned, and since then there have been several educational, political and commercial exchanges. This program is designed for students with a minimum of two years of university-level Spanish. It takes place at the Universidad Autónoma de Campeche, in the southwest of the Yucatán peninsula, in Campeche, Mexico, and is administered by the university's Centro de Español y Maya. Students must have completed SPAN 2020 X/Y.06 with at least a standing of B-. Dalhousie University grants three full credits to those students who successfully complete their classes in Mexico. Students will register via Letter of Permission and grades will be entered on a Pass/Fail basis. Courses will appear on the student's academic record as transfer credits. Three hours of class are given each day, with one hour dedicated to each of these areas. In addition, there are several side trips to places of historical and cultural significance. For a fuller educational experience, it's recommended that students board with Mexican families. They are also encouraged to travel and see Mayan archaeological sites in the Yucatán region, including the famous Mayan pyramid, temples, observatory and ball court of Chichen-Itza. All inquires and applications should be addressed to the coordinator of the program, Prof. John Kirk (john.kirk@dal.ca) or by telephone at 902-494-1082.